Stickers. An associated addiction with pens. I might be a tiny bit insane about them. Just a tiny bit. But barely. And that's not even a half of them. Not even a third. Not even a quarter, really. Nevertheless, I added to my collection, after spending too much time on CoolPencilCase's new arrivals section. 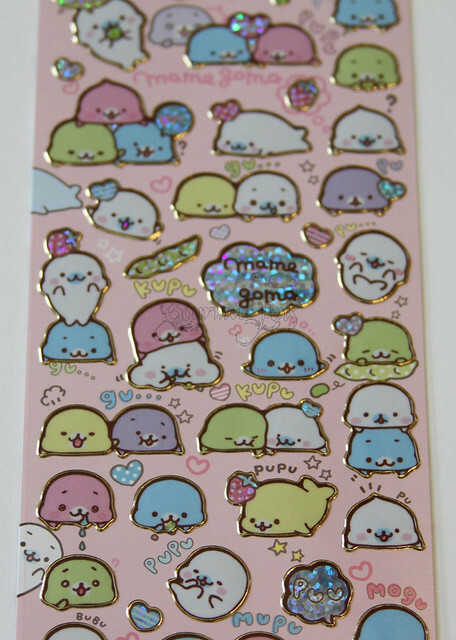 These are the Mamegoma Friendship Stickers, in the "Snacks and Games" theme. They're just so cute. Pen pals can expect these on their letters... when I eventually bring myself to part with them. It'll happen, I promise. I don't even know what they are, really. Tiny happy chubby ice cream plops? Seals? Coloured seals? I don't know. Want some for yourself? Yes you do. They're only $2.65USD. That's less than a Starbucks. They don't taste as good, but they're far cuter. eeeeee! so cute... i also realize that your surgery must be coming soon... feel better soon, i hope!